Innovation is key to responding to the future challenges that confront all sectors of society and the economy. Within tourism, there are numerous corporations and destinations around the world that are responding to the challenges posed by ecological, social, cultural and economic forces and making the transformation toward sustainability through innovation. 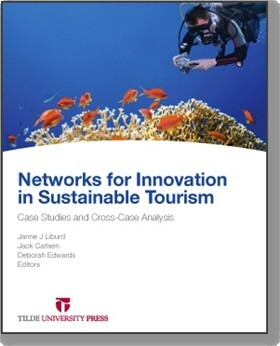 Networks for Innovation in Sustainable Tourism assembles ten case studies of large and small enterprises and destinations in developed and developing nations that are pursuing innovative practices that will enhance the sustainability of their operations. The cases have been prepared for use in research and teaching of innovation, and the analysis and case notes are designed to facilitate discussion and further investigation of innovation, not only in tourism, but in other economic sectors as well. Janne J Liburd is Associate Professor and Director of Research, Centre for Tourism, Culture and Innovation at the University of Southern Denmark. She is a cultural anthropologist and her research interests are in the field of sustainable tourism development. Dr Liburd has published on national park development, heritage tourism, cruise tourism, tourism innovation, tourism crisis communica-tion, NGOs and democratic accountability in the Eastern Caribbean. She has conducted a number of research projects relating to competence development for tourism practitioners and tourism educators. Dr. Liburd is an executive member and past chair of the BEST Education Network. Jack Carlsen is Professor of Tourism Studies and Co-Director of the Curtin Sustainable Tourism Centre [CSTC] at Curtin University, Western Australia. He has expertise in sustainable tourism development, planning and management and has produced more than 100 publications in the form of academic books and journals, conference papers, reviews, technical reports, strategic plans, case studies and other scholarly contributions on tourism and related topics. He is currently Acting Dean of Research and Development in the Curtin Business School and is developing research themes, projects and initiatives both within Curtin and with other universities. Deborah Edwards is Senior Research Fellow in Urban Tourism in the Events, Leisure, Sport, Tourism, Arts programs, at the University of Technology, Sydney. Deborah's interests and publications are in understanding tourists’ spatial behaviour, sustainable tourism, tourism planning, volunteers in tourism attractions and the impacts of events. Dr Edwards is an executive member of the BEST Education Network.